Ciao lovelies! 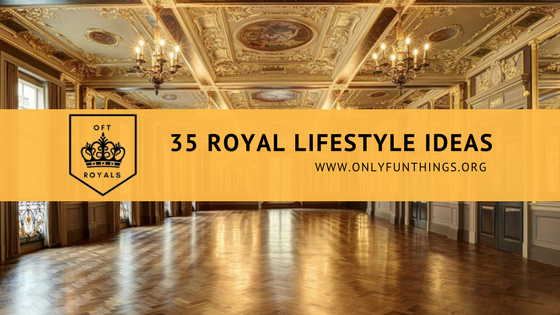 Today, I drew inspiration from the EGL community and decided to write a list of 35 Royal lifestyle ideas. Also- Happy Valentines Day! Specifically, I drew inspiration from THIS list of 101 EGL lifestyle ideas, THIS list of another 101 EGL lifestyle ideas, and THIS spreadsheet of 365 lifestyle EGL ideas. Some of my ideas may overlap with theirs, but I’m trying hard to make my list unique. What exactly are Royal Lifestyle ideas? They’re little tidbit ideas of things to do as part of a Royal lifestyle! Let’s get into the list! 1. Take a luxurious bath. Use bath salts or a bath bomb, or even have a milk bath! 2. Get a doll and dress it up in royal fashions- bonus points if it matches you! 3. Get dressed up and take pictures and have a Royal Photoshoot. Bonus points if you have a friend do it with you! 4. Make or buy a tiara, crown, circlet, or other royal head garment. 5. Make or buy your own handkerchief! Maybe try embroidering a vintage one! 6. Visit an antique shop and look at how people lived before you. Maybe buy an antique item for your room! 7. Make a flower crown, using fake or real flowers. 8. Invite some friends over for tea, bake lots of delicious sweets and savory foods and make a big event out of it! 9. Collect and use adorable stationary, like shaped erasers, cute pens/pencils, cute notepads, etc..
12. Get a pen pal and communicate through written word. Decorate your letters with cute stationary and stickers! 13. Think about royal characters in media that inspire you. They can be in film, books, video games, etc! Maybe write a story about one of them. 15. Start a royal blog or diary all about your life as a modern-day royal! Or even just about one of your hobbies or interests! 16. Treat yourself to a fancy dessert from a local bakery. 17. Or try your hand at baking your own fancy desserts! Make a day of it, wear a cute apron and bake lots of fancy treats, maybe even decorate them yourself, then share with friends. 18. Start a new book, make yourself a kawaii bookmark for it. 19. Have a picnic in a local park, either by yourself with a book or with some friends. 20. Adopt a plant! Maybe even cultivate an entire garden. If you don’t have room for a full garden, try a window box of herbs! 21. Dress up, go out for a coffee (or hot cocoa) and just relax and people watch. Take a break from the world for a while. 22. Try learning a new language like French, Spanish, Latin, or even German or Japanese. Traditionally, Royals were highly cultured and knew many languages. 23. Practice your handwriting. Royals back in the day prided themselves on good penmanship. 24. Take some extra time today to pay special attention to your hygiene/beauty routine, like painting your nails, styling your hair, maybe doing makeup, applying lotion, etc. 25. Try your hand at writing poetry! Bonus points, try writing poetry in a language that isn’t your first language! 26. Plan a trip with friends to a local museum or art gallery. Get all dressed fancy and make a big day of it! 27. If you are still in college/university, go to one of your school’s events and have a good time! 28. Host a cookie decorating party for your friends! Have sprinkles, candies, and even sugar flowers if you can! 29. Visit a graveyard and take note of the different lineages and years on the gravestones. Remember to be respectful while you are there! 30. Do some exercise like Yoga or light jogging. Being healthy can really improve mood and outlook on life! 31. Go to your local mall and try to find some cute Royal accessories to add to your arsenal. Maybe even treat yourself with a pretzel or other light mall food! 32. Cook a meal for your friends, significant other, or yourself! Eat on fancy plates or cute ones, and have a little centerpiece, with either fake flowers or real ones. 33. Go thrift shopping for pieces to add to your Royal wardrobe or even to find unique pieces to decorate your royal abode! 34. Start an art project like painting, drawing, or even writing music! Thanks for reading! I’ll probably do another list like this soon! I love these lists ^_^ I've been really busy/stressed the past week so perhaps I'll try #21 today. By the way, happy Valentine's Day!